The Pininfarina electric car project is moving toward production, with the order books now open for the keenest buyers to register their intentions. A €330 deposit will get you on the waiting list for a car that will be leased, rather than sold, when production starts next year. The car, created by a 50-50 joint venture between Italian styling firm Pininfarina and French components maker Bolloré, now goes by the name of Bluecar, rather than the B0 name that graced the prototype when it was first shown off last year. Perhaps the pair got tired of having to pooh-pooh suggestions that the bee-oh name was a stinker. 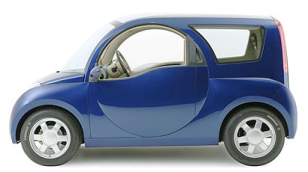 Bluecar was, of course, the name of a 2005 Bolloré electric car prototype built with Renault’s help and styled without the gifted hands of Pininfarina’s artists. Still, B0 or Bluecar are both kinder to the tongue than the name of the joint venture itself: Véhicules Électriques Pininfarina-Bolloré. Catchy. The initial plan is reportedly to lease the Bluecar in six countries: the UK, France, Italy, Germany, Spain and Switzerland. The vehicle will be built in Italy and, given the above list, we wonder whether UK examples will have the steering wheel on the right side.